Why Did Jacob Wrestle With God In The Bible? 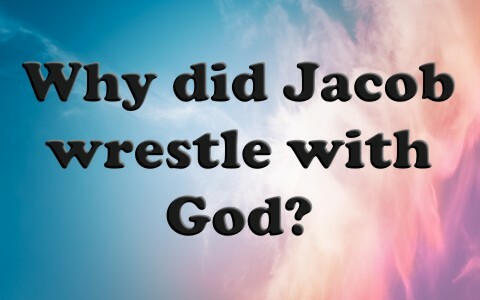 Why would Jacob choose to wrestle against God? Didn’t he know he would lose? The Apostle Paul tells us that we’re wrestling, but hopefully, not against God. No, “we do not wrestle against flesh and blood, but against the rulers, against the authorities, against the cosmic powers over this present darkness, against the spiritual forces of evil in the heavenly places” (Eph 6:12) and without putting on the armor that God’s provided for us (Eph 6:13-18). It’s impossible to wrestle against something you cannot see but know exists, so it’s easier to wrestle against someone else rather than an invisible enemy, but thankfully, God provided every resource we’ll need, plus the strength of Christ (Phil 4:13). Have you wrestled with a besetting sin? Maybe I should rephrase that, “What besetting sin have you been struggling with” since most of us have our own Achilles’ heel, so to speak. We’re only as strong as our weakest link and just like the Apostle Paul wrote, “I do not do what I want, but I do the very thing I hate” (Rom 7:15b), so I have done the exact same thing. I believe, this side of heaven, we’ll all struggle with sin and we’ll battle our own fleshly desires, we not only wrestle against wicked spirits in high places, we wrestle with our own sinful nature. Sometimes we’re able to avoid sin but other times, we fall. It is just as Paul wrote; “I do not do the good I want, but the evil I do not want is what I keep on doing” (Rom 7:19) but the good news is we’re in a struggle. Any old dead fish can float downstream but only those who strive to avoid sin with struggle upstream against the world, the flesh, and the enemy’s evil influence. In reality, both Esau and Jacob were wrestling to receive the blessing of their father, Jacob, but also the promised blessing as the firstborn or the preeminent son in the family. Jacob just wrestled a little harder and wrested from his brother, Esau, two different blessings. Maybe Jacob was wrestling with doubt and fear. This may be why God would later give Jacob a dream about a stairway to heaven where it seems that God was telling him, he has access to God and perhaps, access to God’s angels but more importantly, Jacob will survive this meeting of Esau. Jacob’s soon-to-be father-in-law gave Jacob a taste of his own medicine when he tricked Jacob into marrying Leah when he thought he was marrying Rachel. He had to work another seven years for his father-in-law Laban in order to secure the woman he loved, Rachel. I do believe that from the Scriptures, Jacob desired God’s protection from Esau and his entourage but also to receive a blessing and a promise that God would bring him through this experience and God did just that. Jacob became the father of the twelve tribes of Israel, and Jacob would later bless each of his sons and reveal what their clan or tribe would be like in the future. The beginning of Genesis 32 shows that “Jacob sent messengers before him to Esau his brother in the land of Seir, the country of Edom, instructing them, ‘Thus you shall say to my lord Esau: Thus says your servant Jacob, I have sojourned with Laban and stayed until now’” (Gen 32:3-4) but Esau’s only reply was, “We came to your brother Esau, and he is coming to meet you, and there are four hundred men with him.” Then Jacob was greatly afraid and distressed. He divided the people who were with him, and the flocks and herds and camels, into two camps, thinking, “If Esau comes to the one camp and attacks it, then the camp that is left will escape” (Gen 32:6-8) so we can see that just before Jacob has his encounter with God, he fears for his life and those of his camp. From the entire context of Genesis 32, I believe it is clear that Jacob feared being killed by his brother Esau, because the last time he heard of Esau, he had planned to kill Jacob, but God had other plans. God in human form came to reassure Jacob that he would survive….but more than that, he would thrive and know that God’s access to His throne in heaven was just as accessible as a ladder or stairway would be from one level to another. Jesus gives us access to the throne of grace, but it came at great cost; His own suffering and death, but that’s why the good news is so good; we can be saved by believing on Him and receiving eternal life (John 3:16). Jesus also came in the flesh, appearing as a man, divesting His glory for a time, and “to all who did receive him, who believed in his name, he gave the right to become children of God, who were born, not of blood nor of the will of the flesh nor of the will of man, but of God” (John 1:12-13).